Beyond the norm | Thermal Technology Services Inc. This is one of 120 McKay shovelheads that we processed here in Mt Pleasant. The farmer that brought this to me brought it along with 3200lbs of 5″ laser point ripper teeth. This particular shovelhead typically last approx. 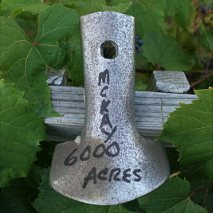 500 -600 acres uncycled or off the shelf. In this case it was run on a unit that carries 120 of these at a crack. Large unit. This particular group of 120 shovelheads were processed and actually run out at 6000 acres. Not typical but a reality. If one does the math ,this is how I view it. 120 ea shovelheads @ apprx. $10.00 ea = $ 1200.00 to process ea approx $4.00 x 120 = 480.00. then take 9 units saved on each leg of digger @ 10.00 x 9ea = $ 90.00 = $900.00 add $10.00 per leg for labor saved not having to change = $ 100.00 x 120 each legs = $ 12000.00 . That’s a more than serious savings.